Sea sponges are an excellent way to provide water to Dubia roaches because they’re safe, effective, and durable. Here are the details, the reasons why, and some tips on how to use them effectively. Sea sponges solve the main water/roach problem, which is that they tend to drown in free-standing water. It doesn’t even have to be much – just enough to cover their bodies – and for nymphs that’s a very, very small amount. When used properly, sea sponges soak up excess water and channel it to their surface, providing the moisture roaches need to survive. Sea sponges tend to stay cleaner than other watering methods because they contain a compound called algeferin that discourages bacterial growth (external link). Anyone familiar with kitchen sponges knows how slimy, smelly, and nasty they get in time. You don’t want that kind of bacterial breeding ground in your Dubia enclosure if you can avoid it. Sea sponges still require a bit of maintenance, but less than they otherwise would without their bactericidal properties. And, unlike kitchen sponges, they do this without synthetic chemicals. Sea sponges hold a lot of water. Much more than a kitchen sponge. They have larger and more dynamically-sized pores than kitchen sponges – a cellular matrix specialized for filtering and circulating large amounts of water. This is important because being a tropical species, Blaptica Dubia needs a more humid environment than most air conditioned or heated homes provide. and they make great humidity boosters. Sea sponges have a lot of surface area. This leads to faster evaporation, which helps raise enclosure humidity to the 40% and higher that Dubia roaches need to thrive. They have much more surface area than water crystals or paper towels. It follows that because of the larger surface area and higher rate of evaporation, sea sponges might dry out faster than other watering methods. This is true to some degree, but the rapid evaporation is at least partially mitigated by the fact that they hold so much more water. While they lose it faster, they also have more to lose. All things equal, sea sponges will stay wet longer than synthetic sponges, but they do tend to dry out faster than water crystals. Another advantage sea sponges are all-natural and contain no chemicals that could harm roaches or other insects, assuming they haven’t been treated. While it may seem inconsequential, this is actually a big deal. Regular household sponges like the ones found in grocery stores are made of polyurethane and contain chemicals like Triclosan, which among its many uses is a pesticide. Sea sponges are relatively durable. They last a very long time when they’re well cared for. The oil-based chemicals in kitchen sponges degrade and break down naturally over time, but that’s not the case with sea sponges. How long they last depends mostly on how they’re used and cared for rather than how quickly they chemically degrade. Wet sponges should not be placed directly on the bottom of a colony enclosure. Always place them in some kind of container like a saucer or a small bowl. It’s also a good idea to make sure the sponge is a tight fit, which helps keep the sponge topped-up and also reduces the number of nymphs that will fall in and drown. While sea sponges resist bacterial buildup, they don’t prevent it. 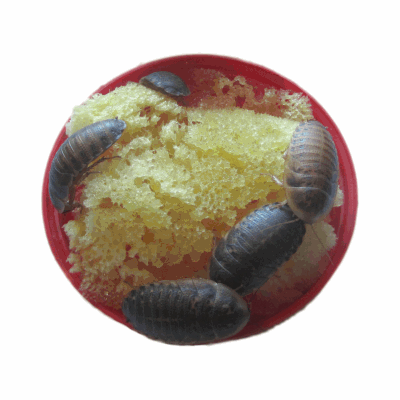 Dubia roaches are typically kept at temperatures around 90 degrees. This promotes rapid bacterial growth, so sponges need to be cleaned often. The minimum seems to be somewhere between two to three days, while the most often they need cleaning is daily. The time depends on a variety of factors. Everything from temperature, humidity, enclosure size and roach population, setup, and state of cleanliness determines how long you can go between cleanings. Feeding fresh fruits and vegetables or finely ground roach chow will mean more frequent cleaning. Submerge the dirty sponge in a bowl of warm water and alternatively squeeze and release until the water becomes cloudy. You can add a few drops of bleach to kill germs, but take care not to add too much because bleach may break down the sponge. Finish by rinsing and drying. Try to use at least two sponges per colony. This allows one sponge to dry completely between uses, which reduces the chance of bacterial overgrowth. It also increases its life. Since sea sponges hold water well, they tend to dry slowly, so a tip for removing enough moisture at cleaning time to allow them to dry out between uses is to squeeze them as tightly as possible between two paper or dish towels. This draws out more moisture than squeezing alone. Repeat once or twice with new, dry towels to ensure the most moisture is removed. Microwaving is a common way to disinfect household sponges, but sea sponges should never be microwaved or boiled. High temperatures break down cell walls and reduce their useful life. The best way to clean a sea sponge is to clean it often. Keeping them clean to prevent bacterial overgrowth is the most effective way to extend their life. Despite their many benefits, sea sponges do have some faults. 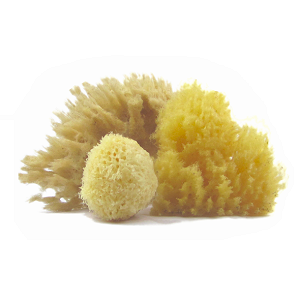 Sea sponges cost more than regular household sponges, and the difference can be significant. They may cost two or three times as much as a regular sponge. To be more cost-effective than water crystals and paper towels, sea sponges have to last. The longevity required to make them cost-effective depends on each situation, but it is common that regular cleaning and a bit of planning are involved. On their own, sea sponges are an effective method for hydrating Dubia roach colonies. There are other methods, so their advantages and disadvantages need to be considered in the context of those other options. They can be a good choice when humidity needs a boost, when routine cleaning is not a barrier, and/or when the user wants an alternative to a “consumable” hydration method that requires regularly purchasing new material.